There is no doubt that virtually everyone has either read, heard or seen some of Wodehouse work, and the success of the various series over the years prove that his writings are classics. Although criticised by some of writing material that is out of touch, his answer was to treat his stories as a sort of period piece and ignore that it was only fairly recent. He also beleived that there were two ways of writing novels. His was of making it a sort of musical comedy without the music and ignoring real life, the other was to go deep down into life and not give damn. Born in 1881 in Guildford, Surrey, Pelham Grenville Wodehouse was the son of a Civil Servant and was educated at Dulwich College (a place he retained affection for until his death in 1975, and has a number of his effects). He started his working life in the Hong Kong and Shanghai Bank before giving up the heady heights of finance for writing. And what a writer! He produced around a hundred books (a nightmare for any collector, but a Godsend for any avid reader! 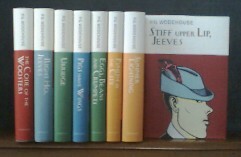 ), created the characters of Bertie Wooster and his ever-resourceful manservant Jeeves, the environs and inhabitants of Blandings Castle, including the prize porker, The Empress of Blandings, and was also involved in some dozen or so straight plays, and about 250 lyrics for musical comedies. He married in 1914 and became an American citizen in 1955. Twenty years later he was made a Knight of the British Empire in the New Years Honours list, and in an interview said his ambitions had now been achieved. He died on St Valentines day in the same year. Whilst this page covers the radio and television adaptation of Wodehouse's work, it would be very remiss of me to not mention the books. There are far too many to cover in depth, but I will say that paperback editons are available from Penguin Books and are generally priced at about � For those of you who like the sumptuosness of a good hardback, and I must be ranked among you, then EVERYMAN'S LIBRARY LIMITED is for you. They are just about to publish a further 4 volumes, 'Psmith in the City', 'Summer Lightning', 'Eggs, Beans and Crumpets', and 'Stiff Upper Lip, Jeeves' and I beleive that the intention is to release the entire catalogue in this style over the coming years. They are priced at the ludicrously low �99 per volume, and I dont' understand how they can do it. To order directly from Everyman, and even set up a standing order, phone 020 7539 7601 or email them. The standing order system not only means that you get the books as they are released, but it also includes free postage in the UK. It is not the same as a bank standing order system and can be cancelled anytime. What it means, basically, is that they process the initial order for the first four books that are out, keep the customer's details on file and then when the next books come out, contact the customer and ask them if they want to continue purchasing the Everyman Wodehouse series. In this way, you will never miss and edition and you also save on postage! Over the years, Wodehouse's books have been adapted for virtually all mediums, and televison and radio have had their fair share. The radio series on the BBC, from the early seventies, was extremely popular and covered most of the Wooster 'chronicles', whilst the World of Wooster and latterly, Jeeves and Wooster, have made impressions as the definitives (of their times) of both Bertie and Jeeves. Detailed below are programme logs for these three series (where I have the information). Over the 8 or so years that the radio series ran on Radio 4, there were numerable characters and what follows is as much information as I have, for the time being, on the entire series. I must point out that THIS IS NOT COMPLETE, and if anyone has additional information, then I would be glad for them to contact me. The number in brackets denote the order in which the actors played the role of that character and do not denote the series or story. Series one, 25 30 minutes episodes. Series two, 9 45 minutes episodes. One off Special, 30 minutes. Series three, 7 30 minutes episodes. Series four, 6 30 minutes episodes. Series five, 6 30 minutes episodes. I would like to thank Penny Fabb for the extensive work that has gone into this log. From this, it can bee seen that the BBC have not only edited the music from the Radio Collection releases, but there are whole episodes that have ended up on the cutting room floor! In the late sixties, BBC Television transmitted a series, well three in fact, of the World of Wooster with Ian Carmichael playing Bertie and Dniis Price as Jeeves. The supporting cast included Derek Nimmo as Bingo Little (for the second series), the Aunts, Dahlia and Agatha were played by Eleanor Summerfield and Fabia Drake respectively, Tracy Reed played Bobbie Wickham, and Paul Whitsun-Jones was Sir Roderick Glossop. The series were produced by Michael Mills, and Peter Cotes, and the adapatations were made, after the Beeb had aquired all the rights to the Jeeves and Wooster saga) by Mills, and Richard Waring (although I have a note that Michael Pertwee, brother to Jon, also assisted with this task). Covering a total of 20 episodes, this was a huge success for the Beeb and it recently turned up on one of the digital channels (and without digital TV I was kicking myself!!!!). As a footnote to this page so far, Wodehouse created many characters, and Jeeves and Wooster were only one pair from a large stable. There have been a lot more adaptations over the years both on radio and television and I hope to bring details to you shortly. In the meantime, I am going to mention one of these, HEAVY WEATHER as it is not only brilliant, dealing with life at Blandings Castle, but also available on video from ACORN MEDIA. Originally made for, and broadcast on, BBC Television, this production of the Blandings story stars Peter O'Toole, Richard Briers, Judy Parfitt, Ricahrd Johnson, Sarah Badel, Roy Hudd, and David Bamber. Orignally broadcast in 1995, this is nearly 100 minutes of glorious Wodehouse, and is catalogue number AV01332.